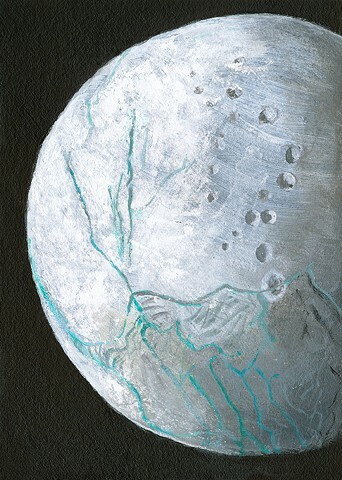 Enceladus is the sixth largest of Saturn's 60 moons, and has a dramatic icy landscape. Enceladus not only has a liquid sea under the surface, but also has active ice volcanoes! This painting was inspired by images captured by NASA/ESA's Cassini Huygens spacecraft, which is still imaging Saturn and its features today. It's hard not to be inspired by the beautiful features of this moon; another gorgeous feature of the local Saturnian neighborhood.